Joe_Cook.JPGHere's where it all began(2nd from right 1st row) While attending the NCO Academy at Ft Sill, I remember taking my turn to march the class. I marched them into the flower bed of the Officer's Training Barracks. I commanded 'Platoon,halt' and then 'about, face' and 'forward, march'. As I looked back I saw about 40 spots of (turning marks) marks in the flower bed gravel. So I then commanded 'double time,march'. A day or two later I was sent to California and then to Hawaii (on a PAN AM flight) and hooked up with the 2/9th. JCook1.jpgHi, Mom! I'm in VietnamHadn't learned to use the .45 cal on my hip when this photo was taken, but it sure kept anyone from stealing the monopoly money that we called "payroll". Note the R-292 antennas and the M2 Aiming Circle in the background. JCook47.JPGOur ArrivalOur convoy coming into base camp at Pleiku. JCook48.JPGOur ArrivalOur convoy coming into base camp. We bought sodas from the locals until we were told that they had glass in them. JCook49.JPGOur ArrivalA bulldozer leads the way straight through the jungle. JCook22a.jpg"Base Camp" - Jan 1966; FDC Trailer brought over from HawaiiCenter & Right: PFC Richard A. Williams & Sp4 Larry L. Black. They are shaving facing the FDC. We had been in-country from two to four days at this point. 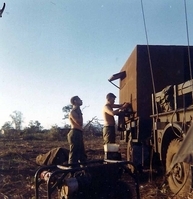 The FDC for "B" Battery was a 3/4-ton truck with generator. The FDC was known as the "Pink Kitty"; it was pink inside. It was made of plywood and brought over from Hawaii. See next photos for the progression of our FDC housing. Our "wash area" is located where my right foot is. JCook38.JPGFrom the "Pink Kitty" to Tent City for the FDCWe bailed out of the "Pink Kitty" FDC. Obviously, it was not sustainable in our new jungle environment. This GP-small tent also served as the FDC sleeping quarters. JCook22d.JPGUnderground Bunker - the orginal CONEX FDC conceptThe next change for our FDC operations was CONEX containers. We buried two (2) CONEX containers in Base Camp. They were dug in with the help of a bulldozer. They were facing each other, dropped into the hole and covered with sandbags. We made a "sandbag staircase" to get back to the surface. I don't know how this would work out in monsoon season. Inside the containers, we used red lights at night and white lights during the day. We moved in our standard field tables for the charts and placed the radios on ammo boxes. JCook29.JPGFDC Tent - Field Version - May 1966After the "Pink Kitty", after the GP-small above-ground tent, after the submerged CONEX containers, this is what my FDC looked like out in the "boonies". Our FDC was arranged in a horseshoe trench; we could maneuver around the firing charts. The Operation was "Paul Revere"; the location is south of Duc Co". JCook45.JPGFeb 1966This is the base camp area. Take note of the mountain "contour" in the center background. It helps to identify the location of this original "Base Camp". JCook19.JPG"Base Camp" - Jan 1966"Base Camp" - We arrived on Jan 1966 (by Starlifter - C-141 on dirt runway) and as you see we are the only one in the area ('B' Battery 2/9 Field Artillery). We only called it "Base Camp" and by February we we in the 'boonies' and never saw Base Camp again. In Jan and Feb of 1966 we ONLY had tents. When I came back in (to rotate out) Dec 1966 there were walkways and wooden barracks and Mess hall. This hole is where we later put in two CONEXs and made our FDC bunker. Left to Right: Sp4 James McBrayer, Jr, PFC Richard A. Williams.